Bentima clocks were made by the Bentima Company Ltd of 18 Bury Street, London EC3. They had a factory at Perivale, Greenford, Middlesex. They were a listed exhibitor at the 1947 British Industries Fair. The Perivale Clock Manufacturing Company Ltd of 2 Wandsworth Road, Perivale, Greenford, Middlesex were also a listed exhibitor at the 1947 British Industries Fair. The precise relationship between the Bentima Company Ltd and the Perivale Clock Manufacturing Company Ltd is not clear. Both companies were primarily manufacturers of mechanical clocks and they clearly worked together on synchronous clocks. Perivale patent 489855, issued in August 1938, describes differential mechanisms for use in striking and chiming synchronous clocks. There are two differentials, one for the striking work and one for the chiming work. In a differential, one sun wheel is driven by the synchronous motor and the other sun wheel is connected to the striking or chiming work. When the planet carrier is free to rotate there is no drive to the striking or chiming work. The planet carrier is locked by the reduction gear at the appropriate time to provide a drive to the striking or chiming work. Improvements to the striking and chiming work are described in Perivale patents 636753 (May 1950) and 643751 (September 1950). A Bentima advertisement in September 1953 refers to ‘New – Revolutionary! All Electric Westminster Chime Clocks’. 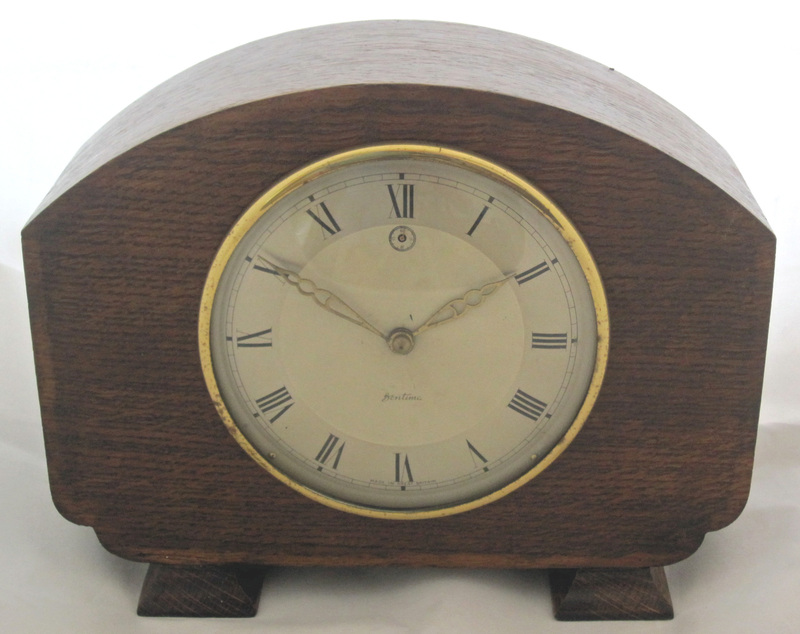 A report of the 1955 British Industries Fair refers to the Perivale-made movement in Bentima chiming clocks. This is described as ‘a neat, though rather unorthodox, movement’. The development of the unorthodox drive to the striking and chiming work started in the late 1930s, and was presumably to avoid infringing Smith patents. For further information on the clock click the link. Interesting and I recognise the hands as I used to have a mechanical Bentima, bought for £4 in the 70s. Interesting tell-tale on the dial too. Cannot access the link below the picture though. I agree about ‘difficult to bring to a reliable working order’. Mine had obviously been tampered with. The minute hand has been distorted, presumably in an attempt to make it strike on time. I managed to get it running as a timepiece and cased it up. It ran for several days but then stopped at 17 minutes past every hour. Some time I must try again. Where can I get the internal movement for a bentima Perivale clock. It is a little piece that screws inside the back with a little cog, and a little wheel. Thanks. Michael. Spares are not easily available. The only solution is to find an identical movement to either use as a source of spares or as a replacement movement.